Both Jarom and Omni explicitly state that genealogy is one of their main reasons for writing on the small plates (Jarom 1:1; Omni 1:1). 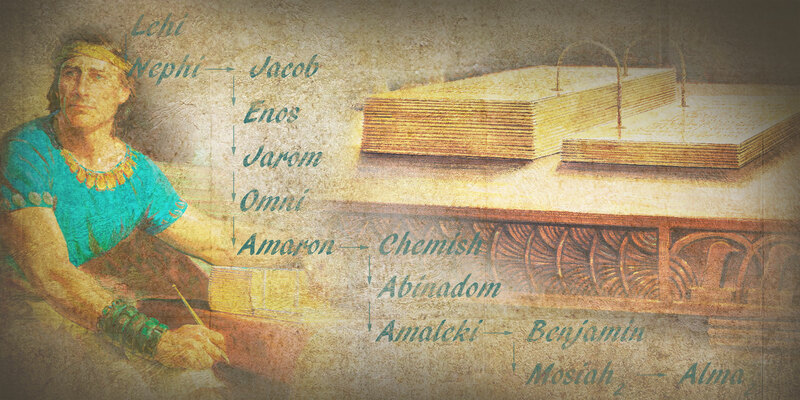 Genealogy was certainly important to Book of Mormon writers, especially the small plates authors. It was one of the reasons given for recovering the plates of brass, but Nephi gives few genealogical details when he reports the contents of those records (1 Nephi 3:3; 5:14: 6:1). Apparently Nephi did not think the small plates were an appropriate place for long lists of forefathers (1 Nephi 6:1). This would seem to be at odds, however, with Jarom and Omni’s declarations that they wrote “to preserve our genealogy” (Omni 1:1). How were they preserving genealogy without recording an extended genealogy? In 1985, Sorenson began to more fully sketch out the concept of the Book of Mormon as a “lineage history.”5 This was expanded on in 1997,6 and finally in 2013 Sorenson provided his fullest comparison of the Book of Mormon and Mesoamerican lineage histories.7 “A lineage history records facts and notions significant for establishing the sociopolitical status of a group whose members claim descent (real or fictive) from a common ancestor.”8 By definition, genealogy was important to lineage histories. The small plates had become the Jacobite lineage history, and thus identifying their lineage was important. This also sheds light on the importance of keeping personal and family histories today. Personal and family histories preserve not only the warm memories of important family occasions, but also transmit traditions and heritage to new generations. John L. Sorenson, Mormon Codex: An Ancient American Book (Salt Lake City and Provo, UT: Deseret Book and Neal A. Maxwell Institute for Religious Scholarship, 2013), 198–218. John L. Sorenson, “The Book of Mormon as a Mesoamerican Record,” in Book of Mormon Authorship Revisited: The Evidence for Ancient Origins, ed. Noel B. Reynolds (Provo, UT: FARMS, 1997), 418–429. John L. Sorenson, An Ancient American Setting for the Book of Mormon (Salt Lake City and Provo, UT: Deseret Book, 1985), 50–56. 1. Brant A. Gardner, Second Witness: Analytical and Contextual Commentary on the Book of Mormon, 6 vols. (Salt Lake City, UT: Greg Kofford Books, 2007–2008), 3:26, capitalization altered. 2. Gardner, Second Witness, 3:26. 3. John W. Welch, “The Father’s Command in to Keep Records in the Small Plates,” FARMS Preliminary Report (September 1984), 8. 4. John L. Sorenson, “The Book of Mormon as a Mesoamerican Codex,” Newsletter and Proceedings of the SEHA 139 (December 1976): 3. 5. John L. Sorenson, An Ancient American Setting for the Book of Mormon (Salt Lake City and Provo, UT: Deseret Book, 1985), 50–56. 6. John L. Sorenson, “The Book of Mormon as a Mesoamerican Record,” in Book of Mormon Authorship Revisited: The Evidence for Ancient Origins, ed. Noel B. Reynolds (Provo, UT: FARMS, 1997), 418–429. 7. John L. Sorenson, Mormon Codex: An Ancient American Book (Salt Lake City and Provo, UT: Deseret Book and Neal A. Maxwell Institute for Religious Scholarship, 2013), 198–218. 8. Sorenson, Mormon Codex, 198. 9. Sorenson, Ancient American Setting, 51. 10. Sorenson, Mormon Codex, 198–218. 11. Sorenson, Ancient American Setting, 51. 12. Sorenson, Ancient American Setting, 55. 13. Sorenson, “The Book of Mormon as a Mesoamerican Record,” 420–422. 14. Sorenson, Ancient American Setting, 56. 15. Sorenson, Ancient American Setting, 55. 16. Elder Dallin H. Oaks, “Taking upon Us the Name of Jesus Christ,” April 1985 General Conference Address, online at lds.org.